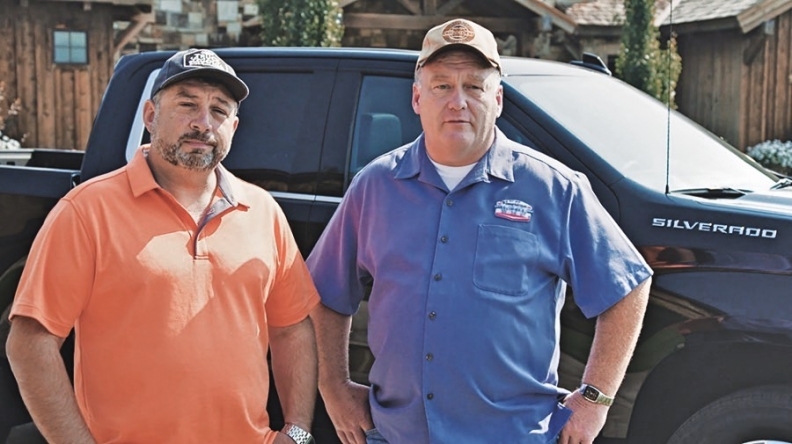 To Chevrolet truck owners Tony Sinclair, left, and Jim McMillian, who have owned 30 to 40 Chevy trucks apiece, loyalty is important. When Chris Budion got an invitation from Chevrolet for an all-expense-paid trip to Jackson Hole, Wyo., to test drive the 2019 Chevy Silverado, he thought it was too good to be true, like some kind of timeshare trap. "We all got the invitation and thought this might be some kind of gimmick," said Budion, a 2017 Silverado owner from suburban Minneapolis who attended the program with about 30 other members of the Chevy Truck Legends program, which recognizes longtime owners and repeat buyers. "Everyone thought there had to be a hook in there that we were all going to be expected to sign up for a new truck before we left Wyoming." There wasn't. In fact, while the event generated social media posts and a video to share with Truck Legends members, there were no formal focus groups or footage filmed for the brand's long-running "Real People, Not Actors" ad campaign. Just truck owners and their guests talking and driving trucks through the hills and wilderness of Wyoming. "It's a really great way to excite everybody," said Hugh Milne, Chevrolet Silverado marketing manager. "We don't try to sell these people anything." The Jackson Hole event last month was one of the most elaborate endeavors for the Truck Legends program, part of an expanding experiential marketing strategy that GM is pursuing to build community and greater loyalty among owners. Through the program, launched in Texas in 2016 and rolled out nationally last year, the brand has invited truck owners to vehicle reveals, NASCAR races and special drive programs, among other events, for free. Chevy Truck Legends members receive exclusive Truck Legends memorabilia. Sandor Piszar, Chevrolet truck marketing director, said the event, like many in the program, was meant as a "thank you" to the brand's most loyal owners, many of whom become grassroots brand ambassadors. "We really want to have a relationship with these folks because they do love the brand, and they're critically important to our success," he said, declining to discuss costs of the Wyoming trip or Truck Legends program. "We look at it as an investment in our most loyal customer base and fostering the relationship. It's hard to put a price on that." 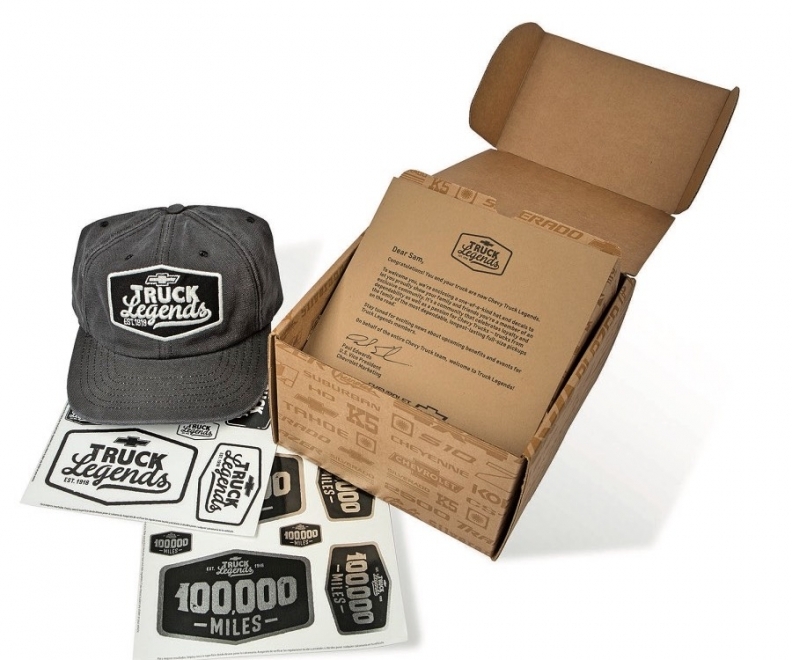 All Chevy Truck Legends members receive exclusive Truck Legends memorabilia, including hats, decals and, if applicable, decals celebrating milestones in mileage or number of vehicles owned. In addition, participating dealers may offer exclusive benefits to Truck Legends members. Customers who participated in the three-day programs ranged from Budion, 49, a self-described "Toyota convert" who has owned two Silverados, to Chevy loyalists such as Tony Sinclair and Jim McMillian. Sinclair, 48, and McMillian, 52, both of St. Joseph, Mo., have owned 30 to 40 Chevrolet trucks apiece — from a 1955 Chevy and C/K trucks to Avalanche and Silverado models. "To me, loyalty is a big thing," McMillian said. "It's something you don't have much anymore across the board. And when Chevrolet recognizes that loyalty, it makes you feel good." "With that loyalty, we pass it down," Sinclair added. "Our kids all drive Chevrolets. It's kind of trickling down to other generations." 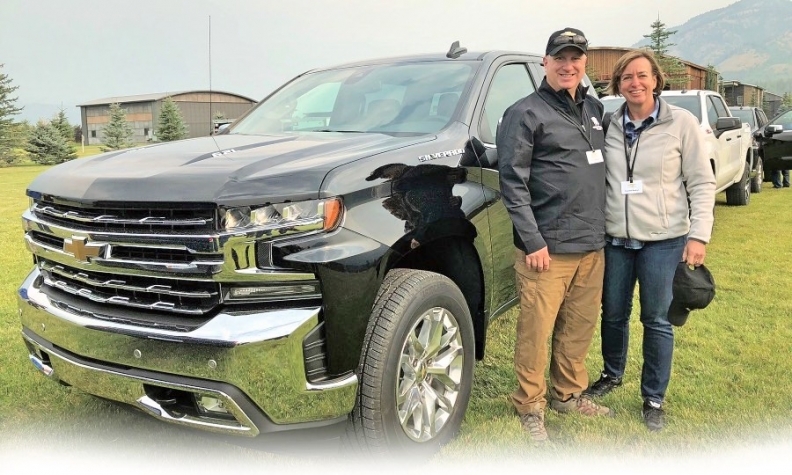 Chevy Truck Legends member Chris Budion and his wife, Cindy, during a drive program for the 2019 Chevrolet Silverado last month in Wyoming. Chevy expects to expand its roughly 60,000 Truck Legends members to 100,000 by year end, according to Piszar, coinciding with the launch of the redesigned 2019 Silverado, which began arriving in dealerships nationwide last month. "It's going to be part of the launch plan," Milne said. "We're going to leverage these people and the loyal base to excite the rest of them about the new truck." That includes involving dealers and continuing to connect Truck Legends members with events that Chevrolet is involved in such as Major League Baseball, NASCAR and concerts, according to Piszar. The Truck Legends program is free to join for customers who have more than 100,000 miles on their Chevrolet truck or have bought or leased two or more new Chevy trucks in their lifetime. Eligible vehicles include Chevy pickups and SUVs such as the Tahoe and Suburban.